Dianne is pleased to run her classes and lessons following The Council for Dance Education and Training “Code of Professional Conduct for Teachers of Dance”. Classes are kept to a size appropriate to the levels and styles being taught – students always being of a compatable age and/or standard. All pupils are trained to Examination Standard – however, entrance into Examinations is not compulsory (34 years 100% examination pass rate). Pupils are entered into Examinations with either The United Kingdom Alliance of Professional Teachers of Dancing or The Northern Counties Dance Teachers Association – both Associations being Corporate Members of The British Dance Council, The Central Council for Physical Recreation and The Stage Dance Council International. All class fees are to be paid monthly in advance during the Educational School Terms and weekly on attendance during School Holidays. Adult classes are for social dancers only and do not involve training for examinations. Classes are payable weekly on attendance. If you would prefer individual tuition (private lessons) these can be arranged (subject to availability). For pupils under the age of 18 years it is necessary for a parent or other adult to be present when the lesson is taking place. Lesson times fluctuate to meet demand. Please call 0191 386 3421 to obtain further details. Intermediate Ballroom/Latin/Sequence dance class suitable for people wishing to improve or further their dance knowledge. Followed by 30 minute practise session. New 5 Week Introductory Course in Ballroom, Latin and Sequence Dancing for Adult Beginners commences Tuesday 2nd October 2018 6.30pm to 7.30pm. Only £30 p.p. for the Course. Once completed there will be the opportunity to continue (same day, time and venue). This will be a fun, friendly class designed as a "taster" to dance. 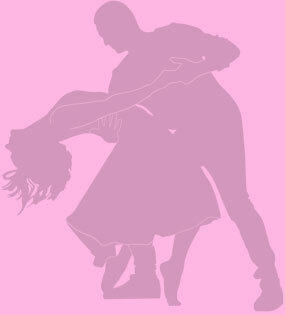 Ballroom, Latin and Sequence Class for people with a little prior dance experience wishing to further their knowledge. (This class is not suitable for absolute beginners - please see Tuesday listing). VENUE: ST AIDAN'S CHURCH HALL, Front Street, Framwellgate Moor, Durham, DH1 5FB. Ballroom and Latin dancing for people with some dance experience. Thursdays - 8.15pm to 9.15pm - Ballroom/Latin/Sequence Dancing for people with a little dance experience.